Besides allowing the local Bitcoiners to meet and buy drinks with their favourite currency, the event will also “allow those unfamiliar with Bitcoin to learn about the currency, buy some Bitcoins off other people to start using them, and of course, to purchase a beer or two with Bitcoin”, explains a press release. “Anyone with a smartphone and a Bitcoin wallet will be able to buy drinks with Bitcoin, simply by using their phone to scan a QR code, which will be generated at the till”, so it’s the standard procedure. “Despite being seeped in history, The Old Fitzroy is embracing the new technology and publican, Garry, has already adapted the Point of Sale device so he can start taking Bitcoin at the bar. He hopes to benefit from the advantages it can offer business, such as lower transaction fees, and also to make the most of being one of the first acceptors of Bitcoin in the Sydney marketplace“. I am interested in Bitcoin because it is progressive. I know a lot of people will like the opportunity to steer away from the big banks and [bitcoin] will have a lot of legs if it can establish itself. But there’s more: the local artist Gustaf Van Wyk “will be launching and selling copies of his new book, ‘An Idiot’s Guide to Bitcoin’, at the event and will be giving a brief introductory and explanatory speech about the currency”. Before the big day, some of the people promoting Bitcoin in Sydney tried the system to make sure everything was working perfectly. And also tried the beer… Well, just to be sure that it tasted properly, as well. 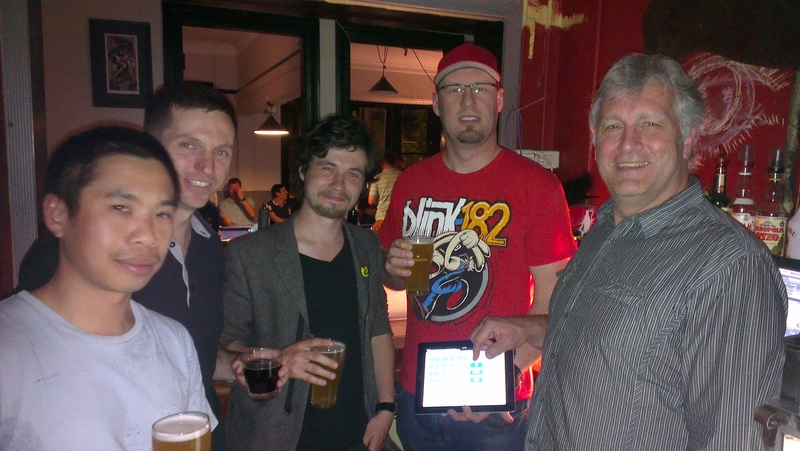 According to Jason Williams, one of the ambassadors of Bitcoin in Australia who already talked with 99Bitcoins before, the last meetup of the @BitcoinSYD group was relocated to The Old Fitzroy to have a trial of Beers4Bitcoins. “For accepting Bitcoin, we used a regular tablet and the BitPOS software I wrote. The trial went really well, there were some minor problems which I’ve now fixed, but no fatal flaws thankfully. Gary was the first on board to use the system and had no troubles with it at all. He said that he thought it would be easy, but didn’t think it would be this easy, a pretty good sign. All the bar staff had a go at it, with no real problem”, Jason Williams told us. On the big day, September 29th, the group @BitcoinSYD is organizing the full event, which starts at 2pm for the media and at 3pm for the general public. “There will be traders on hand from @BitcoinSYD to trade Bitcoin with people who would like some, and others will be fielding any questions people might have about Bitcoin, from your deeply technical protocol questions to beginner questions and to finance, pretty much you name it we’ll have someone on hand who can answer it”, Williams adds. According to the organizers, this will be the first time in Australia that you’ll be able to buy beer with Bitcoins at a pub, so you don’t want to miss such an historic event. Almost worth a trip up from Melbourne for a drinking session! Come on Melbourne! Get on board!